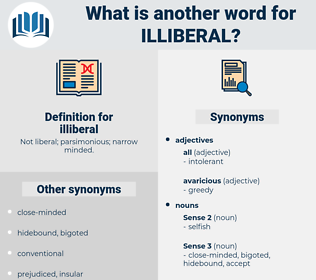 What is another word for illiberal? 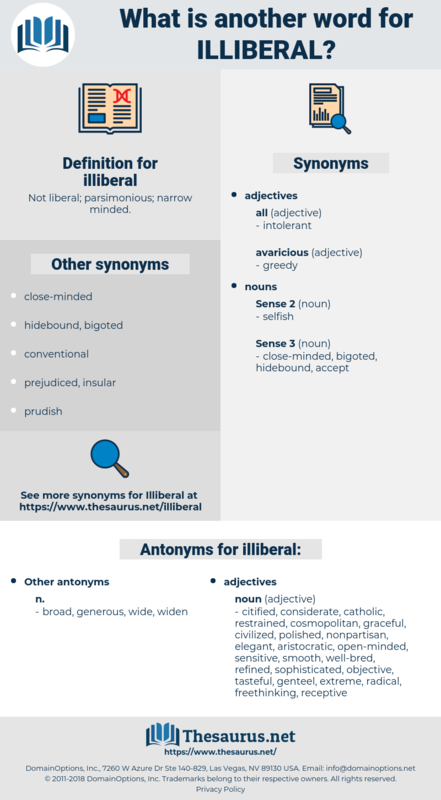 Not liberal; parsimonious; narrow minded. citified, considerate, catholic, restrained, cosmopolitan, graceful, civilized, polished, nonpartisan, elegant, aristocratic, open-minded, sensitive, smooth, well-bred, refined, sophisticated, objective, tasteful, genteel, extreme, radical, freethinking, receptive, urbane, tolerant, gracious, cultivated, unprejudiced, cultured, unbiased, thoughtful, impartial, patrician, courtly, progressive. But one word, James, did you ever think my mother an illiberal woman? The terms of this illiberal measure made, and were meant to make, criticism of the party in power dangerous.